A couple of years ago a friend and I were out to dinner and ended up discussing how much we both love to cook, and how that always makes people ask us if we’ve considered doing it professionally. At which point we both recoil with varying degrees of horror depending on how recently we’ve spent eight hours in the kitchen doing nothing but cook. About twice a year I spend all weekend in the kitchen making the kind of things that if I was married to the French Ambassador I would make all the time to serve at luncheons, but since I’m not, I don’t. This is another way of saying that the Oscars were this Sunday and the Oscars are a big deal in my house. Most years we try and make an effort to see at least some of the movies that are up for the big awards – Best Picture, Best Director, Best Actor, Best Actress . . . . This year, I managed to see the movie least likely to win Best Picture (Juno) and the movie least likely to win Best Animated Movie* (Persepolis) and absolutely nothing else. Oh wait, I lie. We watched Michael Clayton last Thursday night (I’d forgotten it was a nominee for quite a lot of things actually). We really liked it, it was smart and not a cliché, and we think George Clooney is our generation’s answer to Cary Grant. So there you go, nineteen movies up for the big five awards and we managed to see two of them. However, we’ve hosted an Oscar party for the past 10 years and if the threat of cancellation because of the writer’s strike wasn’t going to stop us planning one this year, the trifling fact that we have no opinion about who should win wasn’t going to stop us either. Plus, we mostly watch the Oscars to make snide comments about the red carpet dresses. The Oscars are the time when I pull all the recipes from epicurious for tiny fussy hors d’oeuvres that I’ve been collecting for eleven months but never had an excuse to make, and make them all. I take this as evidence of recurring temporary insanity. Although, it must be said that our annual Oscar party is how I got over my phobia of phyllo dough. I spend most of Saturday and Sunday in the kitchen and I love it, but by the end my back aches and I never want to wash another pan, and I don’t want to even think about doing anything in the kitchen more complicated than pouring a bowl of cereal. And, this is why I don’t cook professionally, and more to the point why there is no Dinner this Wednesday. * Not that I didn’t like Ratatouille, and my roommate loves Brad Bird because he’s just about single handedly staging a come back of hand drawn animation in the US, but Persepolis was amazing and you should all go see it (or rent it). It should probably have been put in Best Foreign Film, but that’s a whole other line of discussion. When I was in elementary school we briefly lived in Old Greenwich and there was this gourmet grocery store called Hay Day nearby which had the most amazing mushroom dip. I think there is still a gourmet grocery store in the building, but it’s not Hay Day and the mushroom dip is no more. This Christmas my mother and I were casting around for something to serve with drinks before Christmas dinner and thought we’d try to recreate the Hay Day mushroom dip. I don’t remember what Hay Day’s dip tasted like well enough to say if this is an entirely accurate recreation, but this is so good that the point is entirely moot. Chop the mushrooms finely in a food processor (really, use the food processor. It’ll take about 30 seconds to achieve what it would take 40 minutes to do manually). Melt the butter in a saucepan and cook the mushrooms until they have given up and reabsorbed all their liquid. 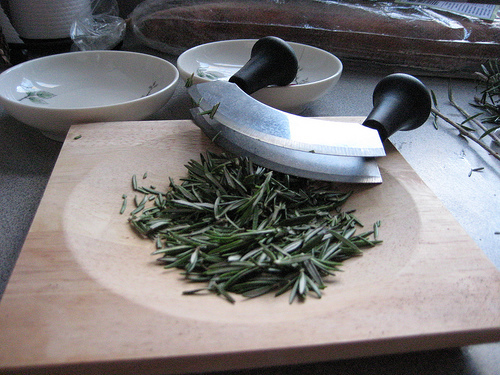 Season with salt and pepper and a little thyme. Allow to cool. 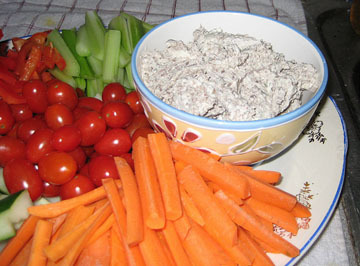 Beat the softened cream cheese and sour cream together until a smooth mixture is formed. It’ll be more of a spreading than a dipping consistency. Add the cooled mushrooms and mix well. Taste and correct your seasonings. Serve with little toast points and vegetables. This is the easiest hors d’oeuvre to make. 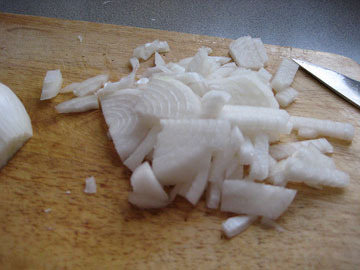 Slice the top third off of several heads of garlic. Place in a baking dish and drizzle enough olive oil over them to moisten them, but not drown them. 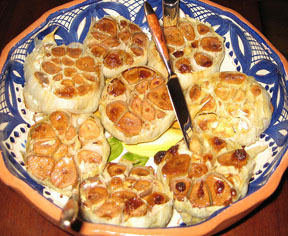 Roast in a 350 degree oven for 40-45 minutes (adding oil if it seems necessary) until the individual cloves of garlic have softened to a spreadable consistency. Divide chicken between 2 large sealable bags and pour marinade over chicken. Seal bags, pressing out excess air, and marinate, chilled, turning bag over occasionally, at least 8 hours or up to 24 hours. Line a 17- by 12-inch shallow heavy baking pan with 2 slightly overlapping sheets of foil, then lightly oil foil. Arrange chicken (with marinade) in 1 layer in pan. Roast chicken at 425, turning once, until deep brown, cooked through, and glazed, about 40 minutes total. Notes: This was the runaway favorite of the evening and will be making many repeat appearances at Dinner. Roll out one sheet of dough into a 12-inch square on a lightly floured surface with a lightly floured rolling pin and cut out 9 (3-inch) rounds with cutter. Mound a spoonful of filling onto a round, brush the edge lightly with egg wash and cover with another round, gently stretching to cover filling completely. 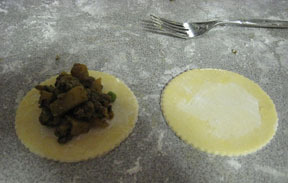 Gently press edges with tines of a fork to seal, then transfer pies to baking sheet. Repeat with remaining sheets of dough and filling to make a total of 18 pies on 2 baking sheets (you may have some filling left over). 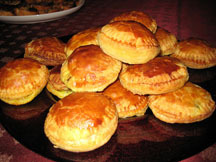 Brush tops of pastry lightly with egg and bake in upper and lower thirds of oven, switching position of sheets halfway through baking, until pies are deep golden brown and puffed, 25 to 30 minutes. Cool pies to warm, about 10 minutes, or room temperature. Beef pies can be assembled and brushed with egg 1 day ahead and chilled, covered, or 1 week ahead and frozen, wrapped well. Bake frozen pies (do not thaw) an additional 5 minutes. Beef pies can be baked 1 day ahead and cooled completely, then chilled. Reheat on a baking sheet in middle of a 350°F oven until filling is hot, about 15 minutes. Notes: Well worth the effort, kind of like a samosa, but without the deep frying. 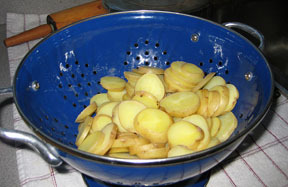 Cut potatoes into ¼-inch-thick slices and cover with cold water by 2 inches in a 1-quart saucepan. Simmer, uncovered, until tender, about 10 minutes. Drain and pat dry with paper towels. Whisk together cream and yolk until combined. Roll out pastry dough* and fit to tartlet pans (the original recipe uses 4” tartlet pans with removable bottoms. I did mine in muffin tins). Chill shells until pastry is firm, at least 10 minutes. Bake at 350 tartlets until bubbling and golden brown, 35 minutes. Serve warm. 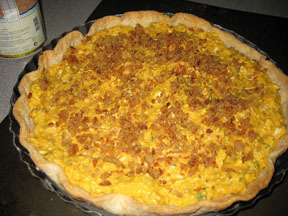 * The original recipe has a pie dough recipe associated with it. I used pre-made pie dough mostly because I hate making pie dough and I’m bad at it, but also because the epicurious recipe calls specifically for San Pellegrino water and that’s just too twee for words. Notes: I’m a big fan of starch. It comes in so many wonderful varieties – potatoes, squash, pasta, bread – and I was anticipating these tartlets being an unctuous combination of starch and cream and cheese. But mostly, it was just bland. The recipe says to serve them warm, but I thought they were much better cold the next day. I’m not sure I’d make them again, but I did like them more as leftovers then I did when they were fresh, somehow the flavors had time to meld and coalesce. On a lightly floured surface roll out dough* into a 12-inch round (about 1/8 inch thick). Fit dough into an 11-inch tart pan with a removable fluted rim. Freeze shell 15 minutes. Line shell with foil and fill with pie weights or raw rice. Bake shell in a 350 oven until edge is pale golden, about 20 minutes. Carefully remove foil and weights or rice and bake shell 10 minutes more, or until bottom is golden. Leave oven on. Cool shell in pan on a rack. Halve squash and scoop out seeds. Lightly brush each cut side with about 1 teaspoon oil and on a baking sheet roast squash, cut sides down, in middle of oven 40 minutes, or until soft. While squash is roasting, thinly slice onion and in a heavy skillet cook in 1/2 tablespoon butter and remaining 1 1/2 teaspoons oil over moderate heat, stirring occasionally, until soft and golden brown, about 20 minutes. Cool squash and scoop out flesh. In a food processor purée squash. Add whole egg, egg yolk, and cream and blend well. Transfer mixture to a large bowl and stir in cheeses, herbs, onion, salt, and pepper to taste. Pour filling into shell, smoothing top. In a small skillet melt remaining tablespoon butter and stir in bread crumbs until combined well. Sprinkle bread crumb mixture evenly over filling. 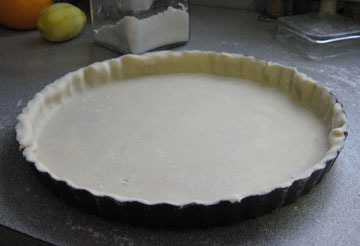 Bake tart in middle of oven 40 minutes, or until filling is set. Cool tart in pan on rack 10 minutes and carefully remove rim. * The epicurious recipe comes with a dough recipe, but I used pre-made because, again, I make lousy pie dough. Notes: Going back to the alternate universe where I’m the French Ambassador’s wife, this would be perfect for a luncheon. Serve a light soup for a starter, and then serve individual squash tarts with salad and finish with fruit. It’s too rich for serve for in a dinner size portion, although friends said that they make this as a squash side dish (using milk instead of cream, ditching the eggs, and only using one of the cheeses, and obviously not baking it in a pie shell). Heat oil in a heavy-bottomed large stockpot on high heat until hot. Cook leeks and onion 2 to 3 minutes. Add carrots and 2 tbsp water. Cook, covered, 10 minutes, stirring occasionally. Add stock, lemongrass and 1 1/2 teaspoons ginger. Simmer about 30 minutes. Let mixture cool for 10 minutes, then pour into a food processor and purée. Add carrot juice and strain through a fine-mesh sieve. Discard pulp. (If not serving immediately, cool and refrigerate liquid.) Add sour cream and remaining 2 teaspoons ginger to strained liquid. Stir until completely incorporated. Heat 3 or 4 minutes over medium-low heat or serve cold. Season with pepper. Garnish with chives and 1 tsp each sour cream. * There a note on epicurious about making your own carrot juice by simmering carrots in a little apple juice and then pureeing it. I think this sounds like a lot of work if you can’t get carrot juice (I got mine from Whole Foods) and I think you could substitute water with maybe a dash of apple juice for some sweetness. Notes: It was good, although next time I would use a lot more ginger. It is very thick and I ended up adding about another cup of water to it and could have added more. It is very smooth, and avoids the grainy texture of a lot of carrot soups. In a bowl whisk together the pumpkin, the egg, the cinnamon, the nutmeg, the ginger, the salt, and the brown sugar. In a large bowl with an electric mixer cream together the cream cheese and the granulated sugar, beat in the cream, the cornstarch, the vanilla, the bourbon liqueur, and the pumpkin mixture, and beat the filling until it is smooth. Line 18 muffin cups with muffin liners and place a ginger snap or a ‘Nilla wafer at the bottom of each. 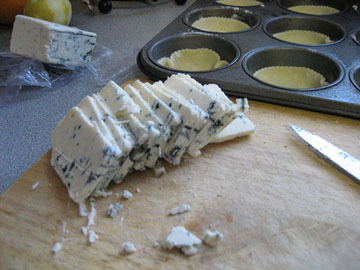 Fill the muffin cups with cheesecake mixture. Bake the cheesecakes in a preheated 350 oven for 15-20 minutes, or until the center is just set, and let it cool in the pan on a rack for 5 minutes. Refrigerate overnight. Notes: This comes from a recipe for a regular sized cheesecake. If you want to make a standard 9” cheesecake increase the recipe by 1/3 (i.e. 1.5 cups pumpkin, 3 eggs . . . ) and bake for 50-55 minutes.